A fresh giant crater has appeared in Siberia's Novokuznetsk Region. Measuring 20 meters in diameter and up to 30 meters in depth, the hole is unnerving the local population, who fear the next one might swallow their homes. The mysterious sinkhole was first spotted by Rinat Sharifullin, a local man whose house is a mere 100 meters away from where it emerged. He blames the sagging of earth into abandoned mine tunnels snaking beneath the ground in the area. "We have to get out of here", Rinat's wife Natalia told local media. "There are mines under our garden, closed down in the 1990s." Emergency Ministry staff promptly arrived at the site, fenced off the crater and filled it with earth. Experts are now investigating to find out whether it was indeed caused by an old mine shaft collapse and if there are more holes to come. This comes weeks after another group of mysterious craters drew attention to Siberia. In February, about 20 'baby' sinkholes appeared around a giant one filled with water not far from Gazprom’s Bovanenkovo gas field. There's no certainty as to what caused those craters. 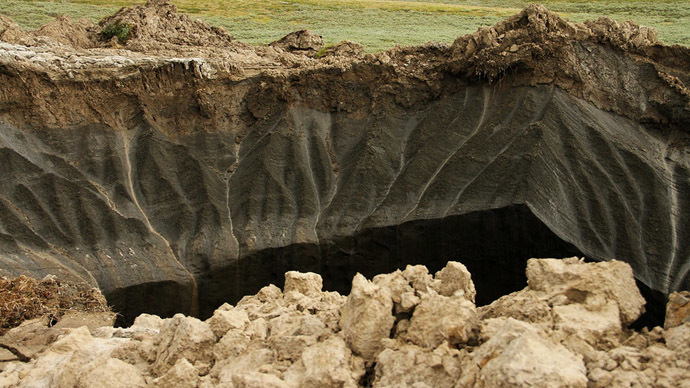 Geologists say the most likely reason is methane emission from permafrost melting due to global warming. Methane is a highly flammable gas, and locals are being advised to avoid using fire near the craters. This also makes it a dangerous job for scientists to study the holes. Whatever the cause, such craters always appear in groups, says professor Vasily Bogoyavlensky from the Moscow State University of Oil and Gas. "I would compare them to mushrooms. If you find one, you will most likely discover a dozen more nearby." Geologists say similar craters in the past could have caused the formation of a number of lakes in Siberia's Yamal Peninsula.